The Apprentice Coach role will give the selected coach(es) the opportunity to work with the National Senior, Development, Para, and Open Water teams at specific international events. This includes specific competitions and camps across all pathways. “Swimming Canada believes that coach development and this practical experience is critical to future athlete development,” said Swimming Canada High Performance Director John Atkinson. The CSCTA will help cover expenses, and will work closely with Swimming Canada to select candidates to attend these initiatives. 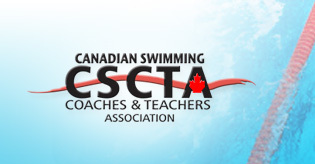 “The CSCTA are excited to continue our partnership with Swimming Canada through the funding of several apprenticeship opportunities and to build on the success of this program in 2018. These programs offer real world international experience for our Canadian coaches as a direct part of the national team programs and will further expand our available professional development opportunities,” said Chris Hindmarch-Watson, executive director of the CSCTA. One of Swimming Canada’s main goals is to enhance development of world-leading high performance coaches and believe the Apprentice Coach opportunity will allow selected coaches to gain international experience and further their professional development. “I had an amazing experience last season as an apprentice coach. It’s the best way to learn; being engaged full time with the team,” said Abderrahmane Tissira, Head Coach for the Regina Optimist Dolphins. Application deadline for all opportunities is April 15, 2019. To learn more about these opportunities and how to apply for them follow the link HERE.